I recently received some correspondence from a reader saying that he has been scanning prints and then trying to email them, but that it took 30 minutes to upload the photo...what was he doing wrong? He wasn't doing anything "wrong", he had simply skipped a critical step that is necessary before emailing a photo: he didn't "resize" it. The original image (in our 3 megapixel example here) is 2048 pixels wide by 1536 pixels tall, which would cover over 300% more than the average computer monitor will show (assuming the monitor is set to 800x600). Another way of saying this is that if you open a 3 megapixel image on the typical monitor (no matter how big the monitor is), you will only see about 25% of it at its full resolution, leaving the other part of the image off-screen. 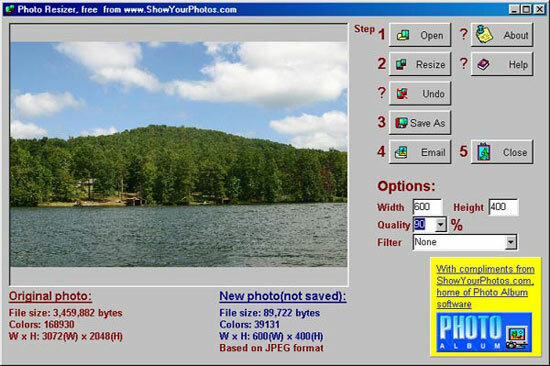 Instead of sending an image this large, you'll want to "resize" that picture of the lake down into a more manageable file, one that will be completely visible on the screen (resolution) and one that will not take too long to send across phone lines (file size). The image editing software that came with your digital camera should contain a resize function. When you resize an image, you simply reduce the height and width of the image so that it is smaller. This is very good for emailing or posting on web pages, but not good for printing. Thus, you should have one set of full-resolution shots for printing, and then only resize copies of the ones you need to email or post on a web page. Also, make sure that when you resize an image, you first make a copy of the original and resize the copy...be sure to leave the original full-size image alone. "You must consider the "environment" in which a digital image will be used. The environment in which an image may be viewed is either on screen or on paper. The difference between the screen environment and the paper environment boils down to how "tightly" the pixels are packed into a linear inch of space (rated as "dots per inch" or dpi). Most computer monitors display 72 pixels for every linear inch of screen; this is 72 dpi. Images optimized for printing need to have the pixels packed much more densely, like 300 pixels for every linear inch, or 300 dpi. Thus, if you have a horizontal line on your monitor that is 720 pixels long, it will take up 10" of screen space (720 pixels divided by 72 dpi equals 10 inches). But if you "pack" these pixels more tightly (say 300 dpi) and print them, you'll still have the same number of pixels in the line (720) but the length of the line on paper will be only 2.4" instead of the original 10". The math for this is [720 pixels / 72 dpi = 10"] or [720 pixels / 300 dpi = 2.4"]; the pixel count hasn't changed, just the number of pixels we "cram" into a linear inch has changed. The "photo resizer" I reference below is for resizing images for screen viewing at 72 dpi. To me, a horizontal image that is 600 pixels wide is pleasant to view on-screen (600 / 72 = 8.33" on screen). But if you print that same image at 300 dpi, it will end up being only 2" wide on paper (600 / 300 = 2"). Thus, you need to do two different calculations when resizing for screen viewing vs. resizing for printing. For screen display, if you want an image to be 6" wide, then it should be (6 x 72 =) 432 pixels wide. But for printing, if you want the image to be 6" wide (on paper), then it should be (6 x 300 =) 1800 pixels wide. This is why I recommend keeping one set of JPG files for screen (at 72 dpi), one set of JPG files for printing (at 300 dpi), and one set that has the "original" number of pixels. One final comment regarding resizing for making prints. I believe that anything you give a printer over 300 dpi is overkill and thus will not be noticeable to the human eye (this applies to inkjet, laser, Club Photo, Wolf Camera, etc). Thus, a 4x6 for print should be 1200x1800 pixels; a 5x7 for print should be 1500x2100, and an 8x10 should be 2400x3000 pixels. Likewise, a 4x6 for screen should be 288x432; a 5x7 for screen should be 360x504, etc. In the most technical sense, this is not really the case, but in what you'll truly be able to SEE, it applies to everyday use." The second product I mentioned is an excellent FREE software product called "PhotoResizer" and you can download it free from my friend Piet Henning's website, ShowYourPhotos.com. 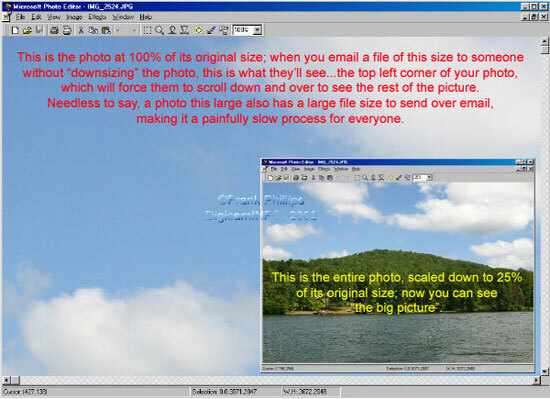 This is about as easy as it gets; the image below is a screen shot from the PhotoResizer, which shows you step by step how to easily resize a digital photo. 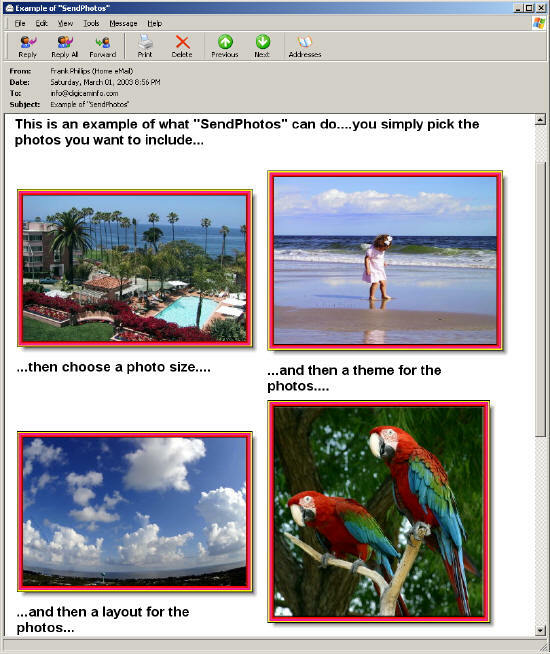 Guidelines for resizing a photo are pretty simple...it has to fit on the screen in its full resolution. That's why I recommend resizing where the largest dimension is no bigger than 600 pixels. In the screen shot above, you can see that I started with a 6 megapixel image (3072 x 2048) and downsized it to 600 x 400 pixels with a file size of less than 90 kilobytes...that's a file size reduction of over 3800%! And to give you an idea of how big (on the screen) a 600 x 400 photo is, the entire screen shot above measures 600 x 400, so that's how big the resized photo would be...big enough to see well on the screen, but small enough to fit entirely inside the screen. Do yourself and your friends a favor: learn how to resize efficiently, and these two products can do all the work for you. Other Options: The one thing that makes the email method of sharing photos difficult is when you want to share more than one. If this is the case, you should consider using an internet-based "photo album". An online photo album is exactly what the name implies; it's an album, or series of albums, that you maintain online, and you can allow or limit access to these albums to anyone you choose using passwords on your albums. For example, if you create an online photo album of your dog Spike, you can simply email the photo album's link to your college buddies...no attachments, no slow uploads and downloads, no problem. You have many, many choices in creating and maintaining online photo albums. I'll discuss three of them here. 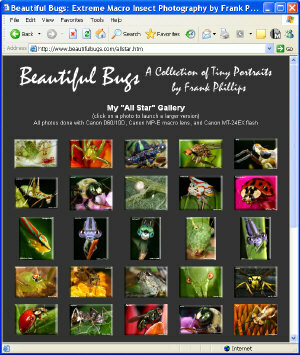 First, you can do what I do, and that is to maintain your own website with your photo albums or portfolios inside (see picture at right). If you have the software and experience, you can have your own website hosted for as little as $50 per year. This is best for us control freaks out there who insist on complete customization. Your second option is to use a pay service for hosting your online albums, such as pbase, photosig, and webshots. Your third option is to use one of the better online printing services, such as Club Photo. For an annual fee, you get a number of permanent online albums, and those who you allow to access these albums can also order prints from them, saving you the trouble. The old-fashioned, tangible option: real, live, glossy prints. If you want to read my opinion on this subject, then skip ahead to my Getting Prints section. It's getting easier and easier every day.